With the help of a star and a scrapbook-covered bottle cap, create a gorgeous holiday tag for any Christmas gift. These cute tags also make fantastic Christmas ornaments. Red satin ribbon, 1/8" x 1/4 yd. Follow paint pen manufacturer's instructions to color edges of foam star; let dry completely. Trace star onto back of dot paper and cut out. Use craft-foam glue to adhere paper to front of foam star. Lightly color paper edges with paint pen; let dry. 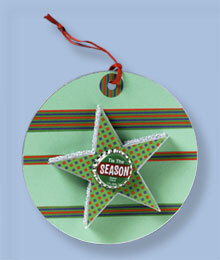 Use embellishing glue to adhere bottle cap to center of star; set aside to dry. Use compass to draw 5-1/2" circle onto card stock; cut out. Measure and cut one 6" long striped-paper strip in each of the following widths: 3/8"; 1/4"; 5/8". Use glue stick to adhere strips to circle; refer to photo for placement. Trim excess, following curved edges. Punch one 3/4" circle from striped paper; glue to card stock above largest strip. Punch 1/4" hole through center of 3/4" circle. Loop ribbon through punched hole; knot ends. Use craft-foam glue to adhere star to center of circle. How about using an old CD for the 5 1/2 in circle. That way the back is really shiney. I made this. It's kind of big. You don't realize what 51/2" looks like until you cut it out. I couldn't find styrofoam stars anywhere. I used 6mm foam sheet. It worked great. I changed it up a bit. I used my left over Close to My Heart papers instead. Other than that, this is a great project.